It’s a true testament to Hayao Miyazaki’s mastery of animated cinema that his 2004 film, Howl’s Moving Castle, is probably his weakest effort, and yet still stands head and shoulders over many other animated films. 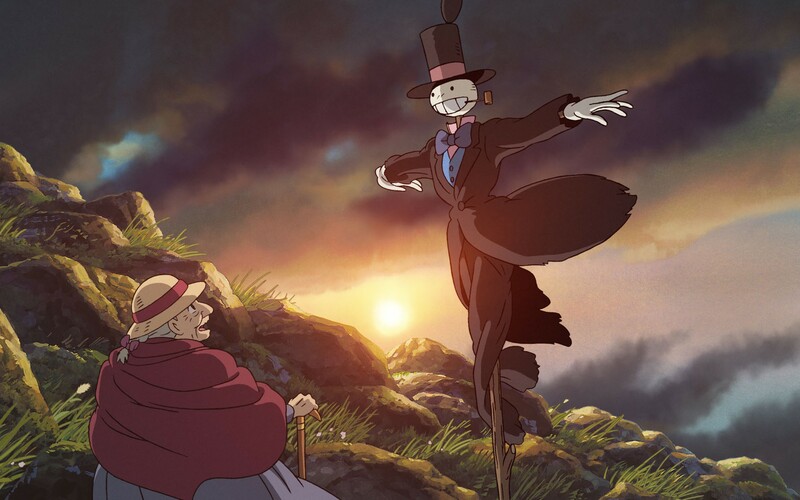 Though it loses its focus and the story can be flimsy at points, Howl’s Moving Castle is still a highly imaginative and beautifully animated treat. 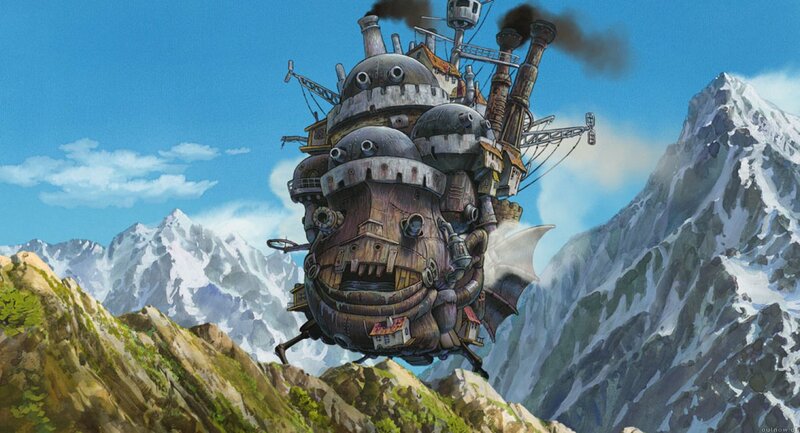 Howl’s Moving Castle, loosely based on the novel by Diana Wynne Jones, had something of an interesting production. Originally set to be director Mamoru Hosoda’s debut film for Studio Ghibli, Hosoda dropped out of the project early on. Ghibli’s most iconic director, Hayao Miyazaki, decided to take up the reigns of the film and continue his filmmaking career, after having previously retired upon completion of Spirited Away. It’s perhaps because of the rougher production, and the fact that it followed such an opus as Spirited Away, that Howl’s Moving Castle falls considerably short when compared to some of Miyazaki’s other works. But it still showcases the legendary director’s unique filmmaking and storytelling abilities. 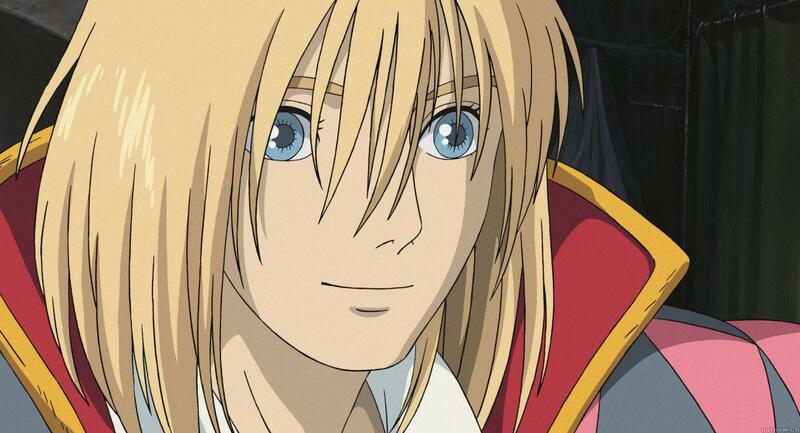 Howl’s Moving Castle takes place in a fantasy world of wizards and magic. A young woman named Sophie lives a simple life running the hat shop her late father left behind. But Sophie’s life changes forever upon a chance meeting with the wizard Howl. A rival of Howl’s, the blobby Witch of the Waste, harbors unrequited feelings for the young wizard, and grows jealous of Sophie. Thus the Witch of the Waste casts a spell on Sophie, aging her into a 90-year old woman and unable to tell anyone of her curse. The now-elderly Sophie travels to the Wastes to search for her younger sister (who is more understanding and level-headed than anyone else in Sophie’s life), but along the way, she encounters an enchanted, turnip-headed scarecrow, who leads her to Howl’s castle, a colossal machine made up of houses and scrap metal that walks on four metallic talons, and is a character in its own right. The castle is not only home to Howl, but also to his apprentice, a young boy named Markl and, most importantly, a powerful fire demon called Calcifer, who powers the castle’s movement and can see through Sophie’s curse. Calcifer is under a curse of his own alongside Howl, and makes a bargain with Sophie that if she can find a way to break his curse, he’ll break hers in return. The setup is, for the most part, excellently done. The big drawback of the opening being that we probably don’t get a lot of time to know Sophie enough as a character before her transformation, but the rest of the story builds up nicely. However, later parts of the film begin to lose the story’s original focus, and the film seems to be at odds with the story of the original novel, and the story Miyazaki wants to tell (this perhaps could be the reason Miyazaki usually creates his own stories, instead of adapting others). First and foremost, a sub-plot in the film involves a war that breaks out between the kingdom where the film takes place (known as “Ingari” in the novel) and a neighboring kingdom. If a war already sounds misplaced in an adventurous family film about a girl being turned into a hag, you’re right. The worst part is what starts as a sub-plot eventually takes over the film, and Sophie’s deal with Calcifer is largely forgotten in the middle of it. Miyazaki has been outspoken about his pacifistic ways, so if he wanted to make an anti-war movie, then more power to him. The problem is that this wasn’t the film to do it with. Even his later film, The Wind Rises, which focuses on a historical figure in the times just before WWII, doesn’t deal with the subject as much. What starts off as a fantastic and whimsical journey of growth in Howl’s Moving Castle ends up feeling confused amid the devastation of war. The film’s other notable flaw is, sadly, Sophie herself. Hayao Miyazaki is famous for creating strong and memorable female characters, yet Sophie is something of the exception to that rule. Though her elderly self shows some strengths in small doses, she as a character ultimately feels like a mere moving piece in the story, as opposed to its driving force. 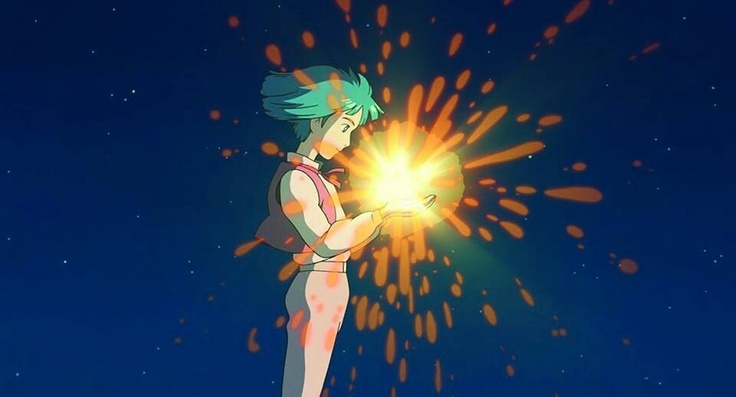 Miyazaki was clearly more fascinated with Howl and Calcifer’s characters, and while they end up being memorable, Sophie, the supposed main character, doesn’t leave much of an impression. This is in stark contrast to most of Miyazaki’s heroines. While Kiki of Kiki’s Delivery Service, Chihiro of Spirited Away and their kin carried their stories, Sophie just seems to be plodding along in the narrative. With that said, I don’t mean to sound too negative towards the film. 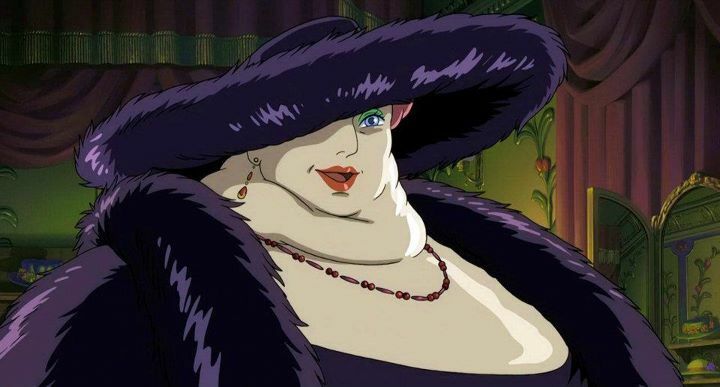 Aside from Sophie, the characters are a fun parade of personalities: Howl is humorously effeminate and conceded, Calcifer is bitter about being reduced to performing chores for Howl, and even the despicable Witch of the Waste, with her blob-like neck and unfounded arrogance, leaves an impression. The film also boasts some of the most exquisite animation of any Ghibli film and, by extension, any animated film. The character designs stand out with originality, their movements are fluid and complex, the backgrounds are richly detailed, and the film creates many memorable moments that could only be created through animation (one scene in which Howl transforms the inner rooms of the castle is a wonder to behold). The titular castle itself is one of animation’s great places. Its outward appearance makes it equal parts character and location, and its inner workings – with portals that lead to different parts of the kingdom – are pure imaginative delights. Calcifer perhaps catches the eye the most, being a perfect combination of the simple (he’s a fireball with eyes and a mouth) and the complex (he’s animated as believably as sentient fire ever could be). Howl’s Moving Castle can also claim to have one of the most memorable soundtracks in the Ghibli library, with composer Joe Hisaishi pulling out all the stops with a score that echoes European influences and captures the magic of the film’s images. It should also be stated that Howl’s Moving Castle is a great film to watch in either its native Japanese language track or its English dub. Like many of the Studio Ghibli films, Howl’s Moving Castle’s English-language version was provided by Disney. In this case, it was directed by Pixar’s Pete Docter (the filmmaker behind Monsters, Inc., Up and Inside Out), and includes voices from Emily Mortimer and the late Jean Simmons as young and old Sophie, respectively. Lauren Bacall provided the sinister vocals for the Witch of the Waste, and Christian Bale – who was cast largely due to his love of Miyazaki’s films – provides both mystique and lightheartedness to Howl’s voice. Once again, however, Calcifer probably steals the show with the voice of Billy Crystal, whose performance here rivals that of his Mike Wazowski from the Monsters, Inc series. On the whole, Howl’s Moving Castle is a delight, with staggering imagination and enough heart and humor to live up to its gorgeous visuals. Its main character is sadly underdeveloped, and its storytelling can’t match Miyazaki’s other works, so for those accustomed to the director’s films it may feel a bit flat by comparison. But by its own merits, it is still a fun and unique cinematic experience that provides good entertainment and depth all these years later. It may not be up to par with Miyazaki’s other films, but being a “minor work” amid such giants is hardly anything to be ashamed of. All fair and spot-on comments about the movie’s qualities and flaws. Still, it does have its charms. I love Studio Ghibli! Have you seen The Wind Rises? I have seen The Wind Rises and I love it! I adore Studio Ghibli to no end. The only one of their films I have yet to see is From Up on Poppy Hill. But I plan on fixing that soon. Porco Rosso is definitely one of my favorites. One of the best films ever made for sure. I will never forget the first time I saw The Wind Rises. When I got to the theater a showing had just finished, and a young girl was walking out with tears streaming down her eyes. It’s an indelible image in my brain. Currently writing another Studio Ghibli review as we speak. Should be published soon. Cool! I look forward to reading it! We saw the Lego Movie and then The Wind Rises, same day. I’m glad it was in that order, cuz I wouldn’t have laughed at all otherwise. Honestly, I flip-flopped with this score so much it wasn’t even funny. Part of me still feels it should have scored slightly lower, but in the end, I was so indecisive I simply had to go with personal feelings. And my memories of watching Howl’s Moving Castle growing up ultimately upped the score I think. I usually try to avoid that at all costs, but I was so indecisive I needed some kind of deciding factor. 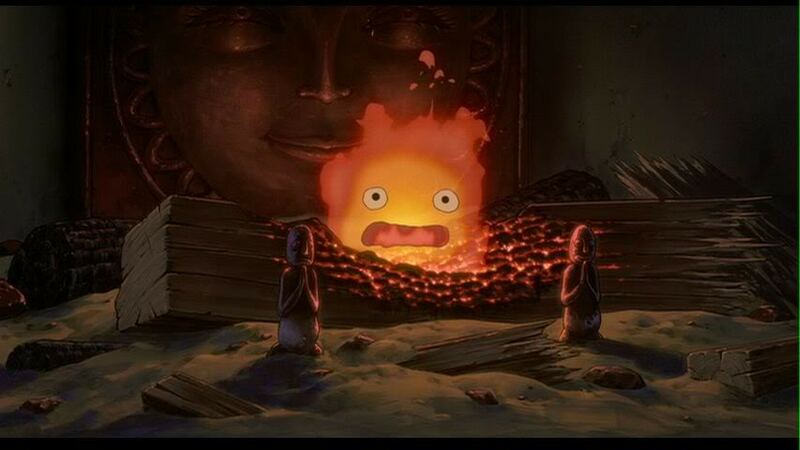 I definitely understand your complaints though (though I don’t know how you can’t like Calcifer!). You are right, amazing animation and “cool castles” can’t make up for a lack of story. For me, I think my opinion of Howl being the weakest Miyazaki feature only came about after years and years of rewatching his films. I guess I can understand if someone hasn’t quite been analyzing it in comparison to Miyazaki’s other works, that its wild imagination might win them over (like it did for me, back in the day). I definitely recommend you watch Ponyo at some point. It shares a similar “obtuse” form of storytelling to Spirited Away and Howl’s Moving Castle, but probably lies somewhere in between. It certainly has better story and characters than Howl, but isn’t as deep as Spirited Away. It may just be the weirdest of the lot, but it treats its weirdness with a sense of playfulness and humor that Howl doesn’t possess, so it’s a much more fun movie than Howl’s Moving Castle.